As I mentioned a couple weeks ago, we are in the (slow) process of renovating our current laundry room and the bathroom off our kitchen. I say “SLOOOOOOW” because we are having a heck of a time moving the process along. The plumber was delayed, the drywall guy we were planning to use just informed me he’s not doing any more drywall until winter, I can’t get a hold of the company we need for our cabinet doors, and the tile guy can’t come until mid August. So… there’s a REALLY good chance these 2 little projects will drag on for the next few months (yup, we’re super bummed as we wanted them to be finished before school started again). One ENORMOUSLY positive aspect of our projects is that we can still do laundry — thanks to the brand new laundry space we created in our basement. Seriously, I can’t even imagine going an entire summer with 4 messy kids and no washer or dryer! 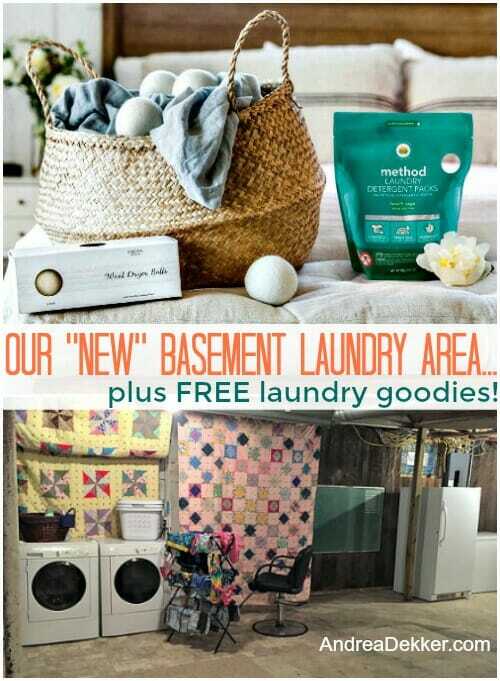 As you’ll see by the photos below, our basement laundry area is NOT glamorous, it’s NOT Pinterest worthy, and it’s really NOT even all that cute. However, it IS functional and (much to my surprise) it’s actually quite practical for our family’s current laundry needs! Yup, there it is — our 130 year old farmhouse basement! Nothing too special, but it’s clean(ish) and it works for us for now! 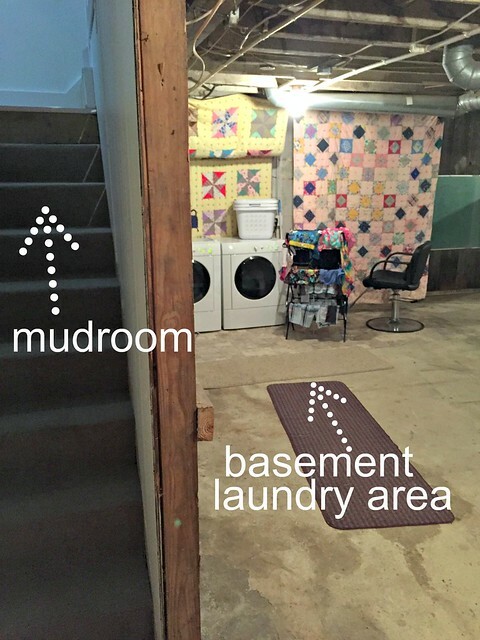 To give you an idea of where the laundry area is located in the basement, it’s right next to the stairs down from the mudroom… making it very convenient to bring dirty, grubby, wet outside gear down here before entering the rest of our house. We’ve had this drying rack forever but never used it because we didn’t have the space to put it up in our previous TINY laundry room. Now we keep it set up in the basement as the PERFCT place to hang damp suits until they are fully dry! 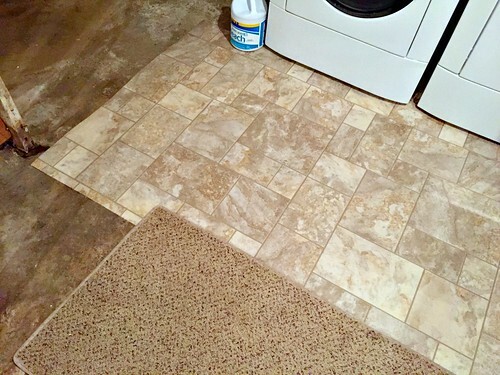 We added a chunk of linoleum under the washer and dryer (and a rug) to cover our dingy cement floors. Linoleum is MUCH easier to keep clean, which is nice in case clean clothing drops as I transfer it to the dryer. 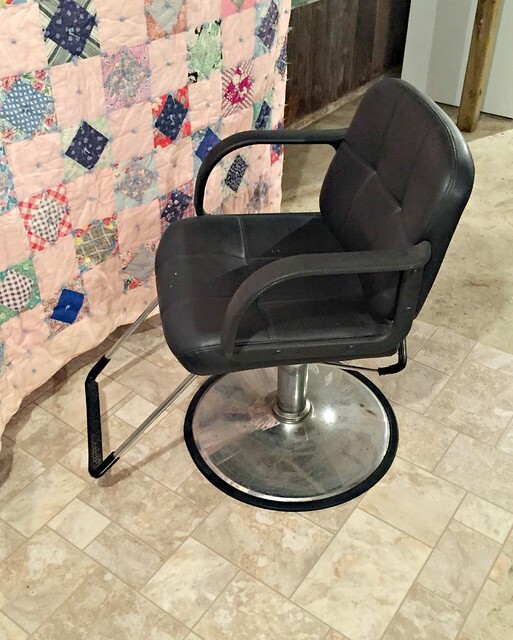 Oh, and if you’re wondering why in the world I have a beautician’s chair in this area…. it’s because this is going to be my new area to cut everyone’s hair! I’ve always cut our entire family’s hair, but never had a designated space to do it (or a handy beautician’s chair!) I recently got this chair from a friend, so I figured this area was a great place to set it up (it’s also on the linoleum floor for easy cleanup). It was roughly $400 for the plumber to set up the hot and cold water, put a drain in, bring a gas line over, and hook up our old appliances. My dad put the new dryer vent in and added new electrical so we have extra outlets and lights in this area. We got the linoleum remnant from one of my parents’ rental properties and already had the rug in our storage closet. The 2 quilts are from Dave’s grandma. I don’t have a current use for them and thought they were the perfect size to cover some of the pipes, duct work, and dingy walls! We already had the washer, dryer, laundry baskets and drying racks in our previous laundry room upstairs. Not too bad, considering the fact this will eventually be our SECOND laundry space once we finally finish the new laundry room on the main floor! I’m honestly SO excited to have 2 laundry areas! If I use the quick cycles, I’ll be able to wash 4 loads of laundry in just over an hour! Since we’re talking about laundry today, I thought it would be the perfect time to let you know about a really great deal from Grove for the month of June. Get FREE Laundry Goodies from Grove! NOTE: If you’re a current Grove customer, you will get a free pack of Walnut Scrubber Sponges with your next order! 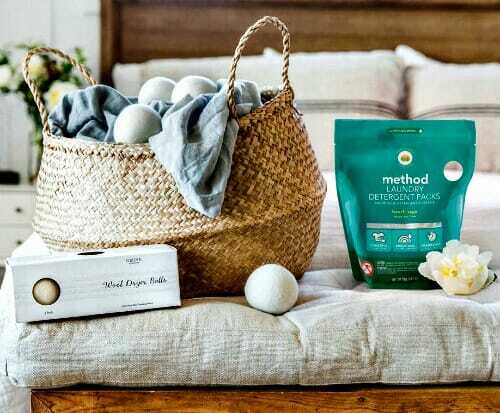 I’ve never used the laundry packs, but I’ve been using the wool dryer balls for YEARS and YEARS in place of dryer sheets — they are fantastic! I just leave them in the dryer all the time (I have 6 of them) so they are never in the way and they don’t need to be stored somewhere when not in use. 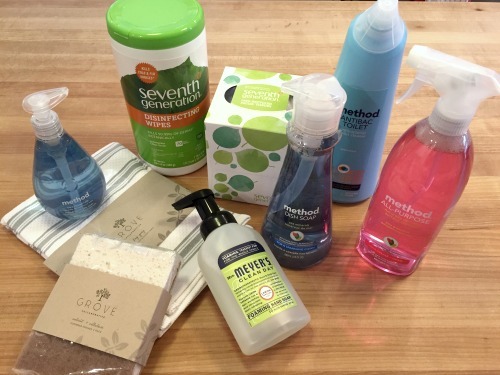 I’ve been using Grove (formerly ePantry) for convenient monthly deliveries of diapers, wipes, various toiletries, cleaning products, and more for almost 5 years now, and I still absolutely love it. 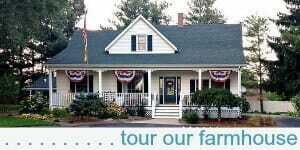 Their prices are competitive, their products are top-notch, and their customer service is second to none! 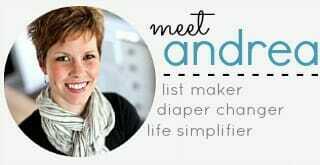 They are a great company that I’m proud to use and promote on my blog! 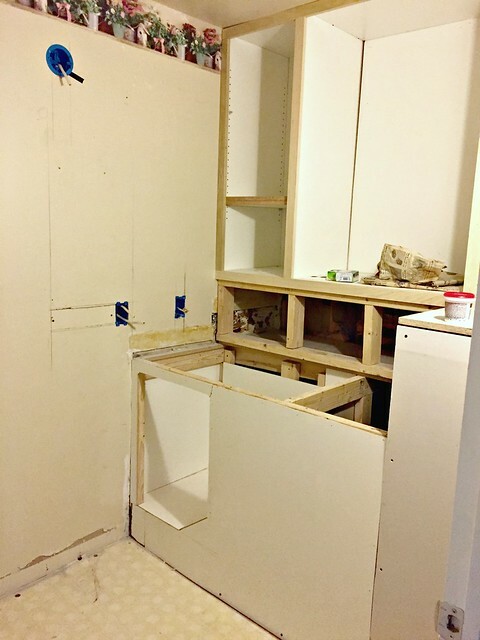 I’m sure I’ll be sharing more laundry related posts over the next couple of months, as we continue on with our renovation process… in the meantime, I’m thrilled we have another convenient place in our home to tackle one of my least favorite household chores! After all, baskets of clean laundry are always preferable to baskets of dirty laundry! 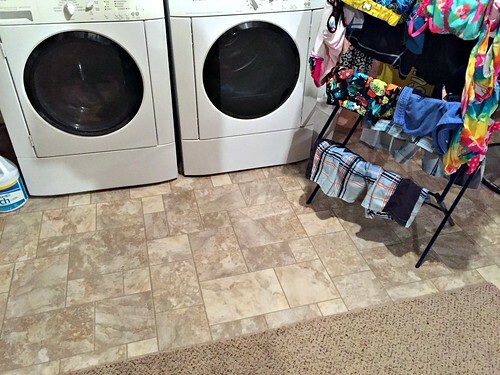 I’d love to hear your laundry room tips and suggestions! 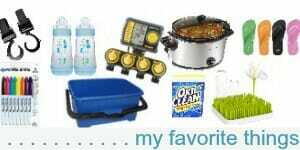 What are your favorite and least favorite things about your laundry room? What would you for-sure want if you were renovating your laundry area? 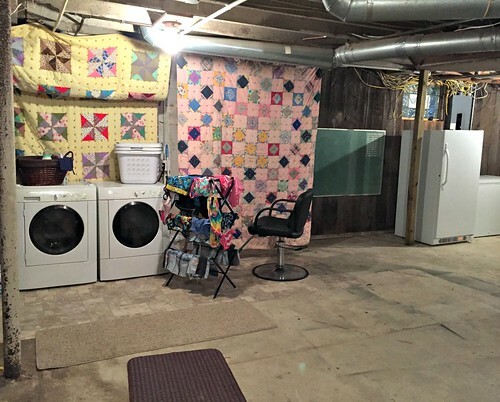 Do you have a basement laundry area? If so, what do you love about it? I hate to leave corrective comments but this is a pet peeve of mine: it looks like what you have is sheet vinyl, not linoleum. Linoleum is made of cork and linseed oil, and vinyl is made of PVC. Even HGTV and Lowe’s get it wrong. My grandma’s house had it, and I hope to talk my husband into using it someday as a beautiful and historically accurate flooring for a 1920’s house! We’re doing the opposite remodeling in our home. My basement laundry has been moved to our first floor in our tiny porch which has just enough room for the washer and dryer side by side . It was a difficulty carrying up and down with a bad back and I love my tiny space. Our bathroom will be gutted and redone this summer so we added a toilet and ‘rustic’ shower in the basement. A simple frame by the drain and a kiddy pool to catch the water makes a great setup for us. We’ll enjoy the second bathroom when family visits. Our 120 year old basement isn’t pretty but we’re making good use of space as you are. I’m not sure if you caught it in the post or not — but we ARE still putting another laundry room back on the main floor again. So we’ll end up with TWO laundry areas in our house — I’m so excited! Love it. I am hooked on Gains original scent, but I’d love to get the wool dryer balls. As always, you do things practically and use a lot of what you already have. Besides so darn cute & adorable, my dream laundry room would have a drop down ironing board and a table to fold. But it’s just me & currently in my rental, the dryer opens in front of the toilet & it’s just me, so I sit on the can & fold laundry. Plus it’s generally just 2 loads a week. I love the space you have! 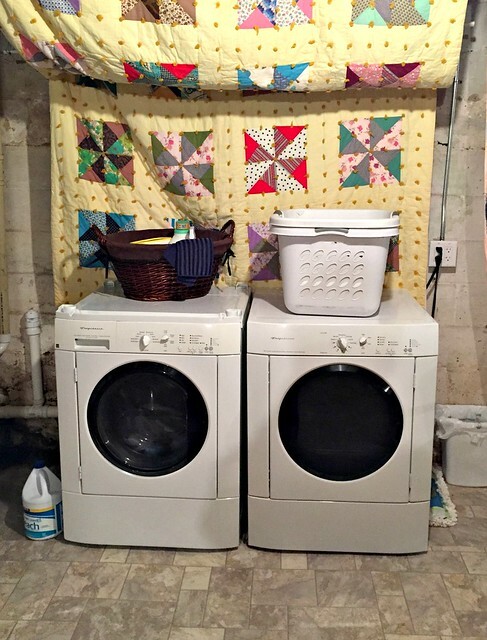 Just wanted to say that I’m concerned that the (beautiful) quilt hanging behind the washer and dryer might pose a fire risk. How brilliant to go ahead and set up the laundry equipment in the basement! Now that there are multiple delays (UGH!) they are nearly so hard to deal with since you can right ahead with processing laundry. The quilts add so much color and brightness. No telling how many people have a quilt packed away that could go on a wall to brighten an area up. Love that you now have a beautician chair. I think all your “customers” should “tip” you with each haircut. Looks good! Hoping it works well for you guys! I always cut my family’s hair too! We just use an ikea high chair for the kids. Not sure when they get bigger tho. Guess we will just have to wing it! yes, we used to use a high chair too — then we tried to put a booster seat on a kitchen stool (which never really worked all that well). So far, the chair seems to be working well! Hi Andrea! Great use of space. I love that you can always improvise and re-organize a space to fit your needs! I have a question about the dryer balls. We have them too and I love them, but I don’t love how sometimes they get stuck inside clothes during the drying cycle and I don’t find some of them until I am folding laundry. Any tips for that you may have? Thank you! 1. I have 6 balls so if 1 or 2 get stuck in the clothes it’s not a huge deal. 2. I fold my clothing right away so I find the balls immediately and put them back in the dryer. I love that my laundry room is huge. Seriously, it’s the biggest one I’ve ever had! (Of course, our previous home had a tiny, stacked unit in the equally tiny bedroom closet, so anything is bigger than that! lol.) It has a storage closet, a table with my sewing machines on it, and a big china cabinet I use for sewing supplies. Yeah, I’m spoiled. But one day I hope to make it pretty. It’s the last room to be updated and painted. It currently has odd, drab lime green walls, with popcorn ceiling in a brighter green, and cabinets in yet another green. We moved in to a very colorful house. lol! I hope we love it as much as you do! I am sitting here reading this post while waiting for the tile guy to show up for our own bathroom reno. He’s only 2 1/2 months late. We have been working on this reno for a year now. It took 3 months just to get an electrician out and my carpenter kept going on holidays. Btw, the tile guy is now late. Good luck with your reno! booo for late service workers. It seriously irks me SOOOO much. If you’re buys, just say “i’m busy” don’t lead me along to think you’re going to show up and then continually cancel at the last minute! We have a basement laundry are because we have no other options. It is great for dirty/wet/muddy clothes. Are you planning on having two washers/dryers in your home? 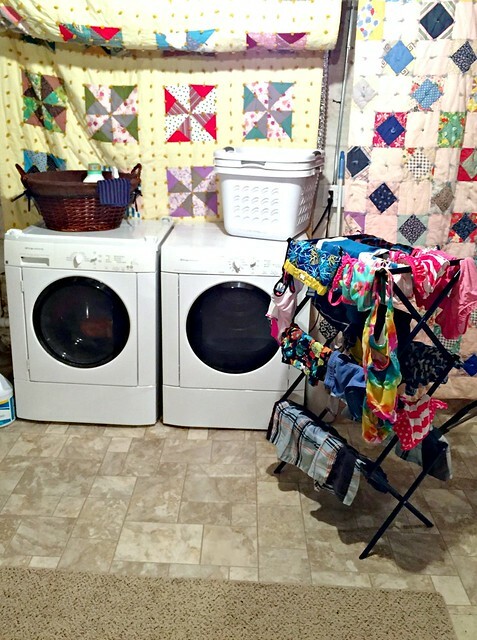 yup, 2 washers and 2 dryers — glorious! Wanted to mention something my dishwasher repairman taught me…. using the “quick cycle“ on your dishwasher and washing machine are the most energy draining ways to use those appliances. He said people assume that because the cycles are “quick” they are efficient, but the reality is that the most efficient is the normal cycle even though it may take two or three times as long. The way my repairman described it to me is that it’s like driving a car… You can drive 100 miles per hour and to get to your destination faster, but you use way more gas in the process and the wear and tear on your vehicle is greater. So to keep your machines truly “energy efficient” use the regular cycle! I agree! My “normal” cycle is nearly an hour and I don’t have time for that! LOL! I think my normal cycle is over an hour — yikes! And just think how long it would take to do it ALLLLLLLLL by hand. Sigh — we are so spoiled! I learned from Andrea to wash all my laundry together, with no sorting. During the day, any dirty laundry goes straight into the washer. At night I add detergent and set the washer to wash about an hour or two before I wake up. So I wake to clean clothes. This way it wouldn’t matter if you used a longer, more energy-efficient cycle, besides having accomplished something before you even get up. Thank you Pamela for that information. I had no idea. I’d much rather it take a little longer and know I won’t have to replace these expensive appliances sooner than later.